To Pleat, or Not to Pleat. That is the Question! Here’s the answer: FOR THE LOVE OF ALL THINGS HOLY, NO! Ok, so the answer is a bit more complicated than that. The wearing of pleats by men (because women should really never wear pleated pants, period!) is a tricky art that should only be attempted by those who know what they’re doing, or have a woman around to help them. The pleated pants that Darren referenced in some earlier comments (pictured here) are ok. However there is a certain male body type that can get away with pleats, and if you’re not a Gap model, chances are you’re not it! Do you have anything that might be construed as a “belly”? NO PLEATS! Do you have large thighs (due to muscle bulks or body type)? NO PLEATS! The thing with pleats is that they add extra fabric to to the front of your thighs. If they’re not able to lie absolutely flat from waist to mid-thigh, they’ll just pucker and pooch out and look silly. This means that if your beer-gut prevents you from actually wearing your pants on your natural waist, or means that your body does not have a flat surface from navel to crotch, you can NOT wear pleats. And if you have large thighs – either because of your genetic makeup, or from a lot of muscle bulk in the area, having pants with extra fabric there will likely make you look somewhat disproportionate. See how there’s some extra bulk of fabric on the thigh of the model? If you have large thighs in proportion to the rest of your body, your pleats will either stretch out over your quads and look like spandex (if you buy the pants to fit your waist), or billow around your body like the MC Hammer pants of yesteryear (if you buy them to fit around your legs). Try poufy sleeves instead (and if you didn’t get that I was kidding with the poufy sleeves, you’re beyond any fashion help I could give). The other issue with pleats that makes most men wearing them look ridiculous is that they require pressing. And not just running the iron over them hoping for the best – but actual proficiency to get them to lay flat. Most guys I know will just wash their pants, and either hang or fold them, then put them on without even going near the iron (do you even own an iron?). This usually results in the pleats not being flat, and doing the poochie-outie-thing right below your belt, making it look like you’ve got a really low-hanging spare tire. Either that, or the act of folding the pants will result in the creases being mangled, resulting in your pants making it look like Picasso attached your legs to your body. Either way – unless you’ve got perfect waist to knee body proportion, AND the desire and knowledge to properly press your pants (or someone around who will do it for you), please just say no to pleats. When this topic first came up, I was prepared to disagree with you, as the M-man has a couple pairs of “dressier” pants that have pleats (like the ones shown above) and looks great in them. Now that you’ve clarified your position, I see that we are both correct – I agree with everything you’ve said above. The M-man is, in fact, slim enough to wear them and does know how to work an iron. 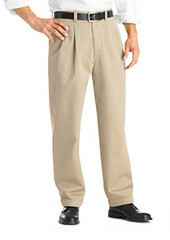 Pleated pantsare the second most god-awful thing a man can wear…the first of course being tapered pants. Whew, thanks for clarifying. I shall break out the snapline and level to evaluate the the flatness of my navel-to-crotch region. Which is more unflattering: pleats, or pants that stretch so tight you can tell how many keys are on my keyring? Mike: In that instance, I would say get thee to a haberdashery. Preferably one with a good tailor. You may be a pleats kinda guy after all, but I strongly suspect that you may just be buying ill-fitting pants. And if your thighs are really that big, you can always buy a size larger, and get the waist taken in a smidge for a more flattering fit. Just stumbled on this randomly. Here’s the thing – for a guy who isn’t real thin around the middle, don’t flat fronts accentuate the extra weight? Everyone says that pleats are awful, but I feel like that wide space in front from flat front pants actually accentuates your weight? Thank you! Been trying to convince my fiance to nix the pleated suit pants and baggy jeans. Eck! Finally have some back-up! Has anyone tried to find flat front pants lately? Impossible! Everywhere pleated! Wait…here’s one…pleated…DAMMIT! And finding pants for normally proportioned men is no picnic either. Everthing is cut for fat guys. Try to find a 34-34. Plenty of 44-34, jeez. Wait… here’s one…pleated…DAMMIT! Found some at the Gap yesterday. They’re definitely out there if you look!